Over the years I’ve grown quite a lot of that most wonderful annual herb, Perilla, Shiso or Beefsteak Plant. Traditionally, it’s found in Korean, Japanese and Vietnamese dishes, and Shiso is its Japanese name. 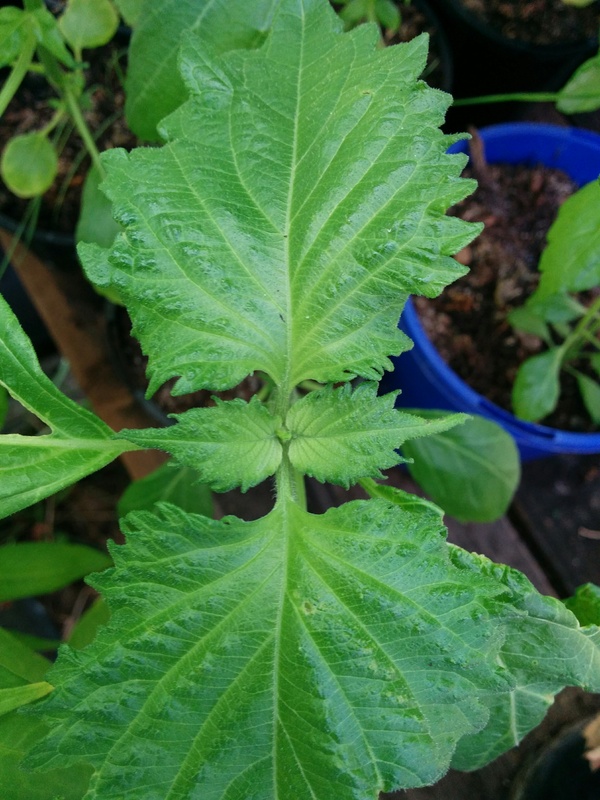 In particular the green variety (Perilla frutescens) which I prefer, seems to like my greenhouse very much. The unusual aroma and flavour is a welcome addition to summer salads in my household. Flavour-wise, I think it plays a similar role to Basil in Mediterranean dishes, and it is sometimes sold as Japanese Basil. I just wash the leaves thoroughly, put them through the salad spinner and chiffonade them. We also love it as a flavouring for steamed rice and stir fries and the whole leaves for tempura. This year I’ve had a fabulous crop and I began to wonder what else I could do with it. That got me thinking about other Japanese flavours and what would happen if I started experimenting with a pickle. In Japan, Green Shiso is salted and the whole leaves are layered in jars for use during the cooler months and the Red Shiso is used to make Umeboshi but I found a wonderful cucumber recipe at Food52 that I’ve adapted for my needs. I wanted to have pickled leaves I could use whole as wrappers or shred up as required and this looks like a winner! Wash the Shiso leaves carefully to remove any grit, pat dry or put through a salad spinner to remove excess moisture. Lay the leaves on top of each other and very carefully roll them, feeding the entire roll into the jar. In a non-metallic mixing bowl whisk the other ingredients thoroughly until the sugar and salt are dissolved. 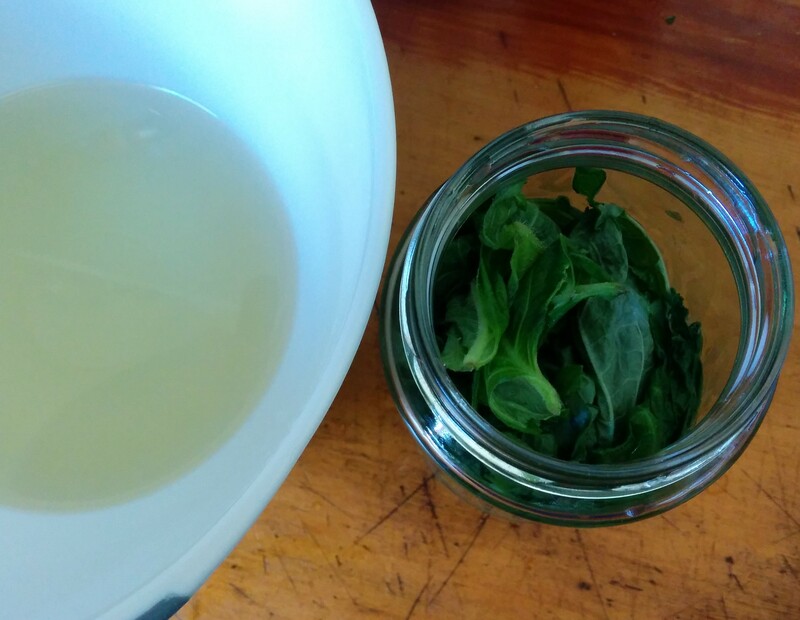 Pour this over the Shiso leaves, close firmly and refrigerate. This will be ready to use in a few hours but will benefit from leaving for at least a couple of days. I have no idea how long the leaves will last in the refrigerator but as I use a few and make room, I plan to add some thin slices of the little cucumbers that are starting to fruit. I confess I took a nibble this morning and it’s as wonderful as I hoped it would be. The big factor for me is the flavour of the pickling liquid, which is very similar to a dipping sauce. Also, I used some of the vinegar I made from a failed cider about three months ago and it’s pretty special just on its own! I will write a post about processing the vinegar with details and photos soon. Meanwhile, I’ve finished and submitted my assignment and I’m back to my wonderful people at OAK Tasmania tomorrow – summer holidays are over for me. But the days are still long and luscious for gardening and cooking.